"Un objeto de gran belleza" That's a beautiful Spanish phrase isn't it? It means, "An object of great beauty". I can't think of anything that describes this guitar more eloquently and accurately. Where do I begin? This stunning instrument is a work of art that also happens to be an incredible guitar. 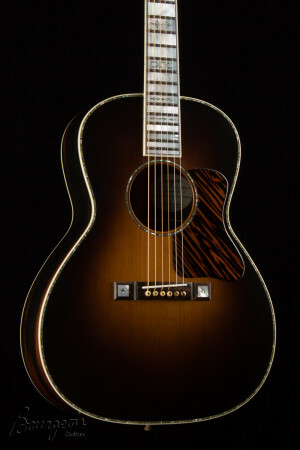 It has a wonderful tone thanks in part to the Aged Tone Adirondack Top. Of course, the Brazilian Rosewood back and sides doesn't hurt either. This is a presentation model, like the beautiful presentation grade guitars and banjos made by the great instrument makers in the early 1900's. Instruments that were designed to represent the penultimate of the maker's art. The Bourgeois L-DBO-Presentation is that and more. This is as good as it gets, my friends.